Virtual Reality is going to be useful for a lot of use cases, not just gaming. We explore the ways the technology will be used for training, marketing, product design and much more. SAP enterprise application possibilities in AR and VR have potential to grow in areas like manufacturing industries, medical field, etc. VR typically immerses the user in a virtual world via a headset that largely isolates you from the real world. We can experience anything, anywhere, through the power of virtual reality. For more cutting-edge immersive experience VR system such as the Oculus Rift or HTC’s Vive Pre, for example. And for less immersive experience smartphone-based systems such as Google Cardboard and Samsung’s Gear VR are available. A web framework for building virtual reality experiences using WebVR with HTML and Entity-Component design. This framework works on Vive, Rift, desktop, mobile platforms. VR Use Case for Enterprise. ● Field services improvements and new user experience can be established using Virtual Reality. One of the most compelling drivers of VR in the enterprise is helping field services. With these VR applications, experts can see what the technician in the field is seeing, even if he or she is half a world away. ● Using VR to optimize product engineering, design, manufacturing, and operations. ● VR can help manufacturers get an idea of how their processes are performing, as it can help them spot problems and areas ripe for improvement. SAP being the key enterprise solution for these industrial process when combined with the VR platform the experience is seamless by providing the SAP process in VR. When the data from IoT devices and SAP are integrated it will provide a robust user experience. SAP + IoT + VR based applications can be deployed in SAP cloud platform and on-premise systems. VR could possibly provide a next-gen user experience for some SAP process. 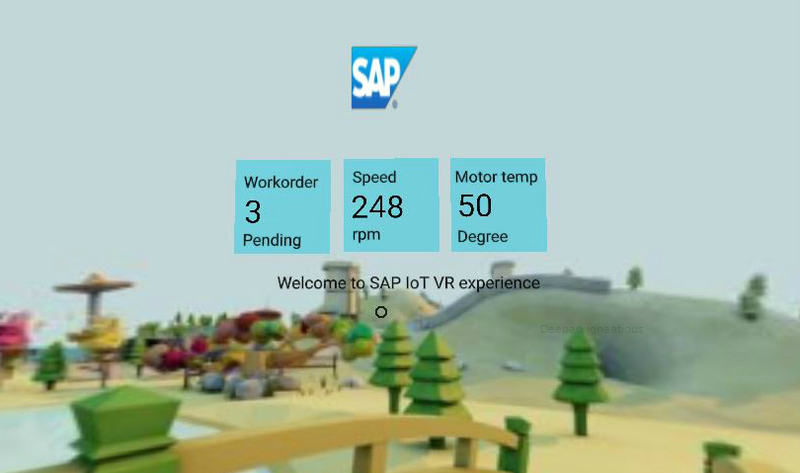 I have developed a VR application which has SAP Fiori style like launchpad providing some insights about SAP process.The VR App is interfaced with SAP using Gateway.The detailed scene enables field service like use case to let the user have an immersive experience of the motor located in remote area.The user can look through the details of the connected motor.For demo purpose, I have used temperature and speed sensor to measure the value.The IoT sensors are interfaced with ESP8266 wifi module to push the data via the internet. Watch the below video for Demo.